It's time for my annual notice that I'm not blogging here no more. Yep, one year ago, I retired Elsewhither the Blog and set up shop at my new place: charliehills.com/blog. I decided that maintaining multiple blogs with divided readership probably wasn't the best idea for someone without any significant reader base. I could probably pull it off if I were J.K. Rowling or Katy Perry. But alas, I am neither. The new blog -- and the new brand, really -- is simply me. Whereas here I used to post about my writing, on the new site you'll find posts about my writing. But not all the time. I've posted nearly every Friday since the switch on January 22, 2016. To see what you may have missed out on, visit: The Recent Posts Page. Nearly a year ago I kicked off Version 2.0 of this blog with a new look, a new purpose, and a new direction. I then promptly stopped posting. I had a very, very busy year in 2015. Most of it concerned the day job, so there's no point in talking about it here. The rest of it concerned a house move (which is still in progress, and still sucking up time). About a month ago I was thinking that 2016 might be the year to really turn this thing around again. But then a funny thing happened on the way to the revival. I decided it was probably best to just shut down this blog completely. But fear not, my two or three readers. I'm not going to quit blogging. I'm only going to quit blogging here. Click the funny picture to continue following me. You won't regret it. Posted in Site Administration | Comments Off on That’s All Folks! It's been two months since my last post. I talked about how the fall season really makes me want to hunker down and write more than any other, then bemoaned the fact that I have absolutely no time to do so this season. I didn't sneak in that "15 minutes a day" like I'd hoped. But I also didn't do nothing. I started a new book earlier this year (between my February and October posts) and never wrote about it here. It's not a novel, which means it has a much, much better chance of getting finished. My track record for fiction is: 0 for 6. My track record for non-fiction is 3 for 3, and this should make it 4 for 4. I made really good progress in March and April and then dropped it because: well, life. But before November (and NaNo) completely ran out on me, I decided to dust it off and at last put in that fifteen minutes a day. What I found was a book that was far more complete than I remember. It was always going to be a short one, but I still thought I had further to go to wrap it up. I filled out one or two empty placeholder sections then realized that Draft Zero was happily complete and I could start on the first revision. The time I have to work on it hasn't increased at all, but I'm still going to shoot for fifteen minutes a day. My best guess at this point: I finish up the move, get settled into the new house, and then publish this thing exactly one year after I had originally hoped to: September 2016. I know, that feels like forever away. We think of time travel as the stuff of science fiction: books, television shows, movies. But I'm here to tell you it's real. I mean, on February 9, 2015, I must have climbed into a time machine because the next thing I know, it's October 1, 2015 and I definitely did not pass through any of the time in between. Here's the thing, though. Time travel is real. We are all moving forward in time, together, at the same rate. And whether we're aware of it, or if we remember it, or whatever: it doesn't matter. We are all time travelers. I began 2015 with an extremely high amount of optimism. I was still on my writing high from NaNoWriMo 2014. I dusted off the audio studio and actually recorded some music. I even rebooted this blog, with plans of wowing everyone each week with some new creative accomplishment of mine. A funny thing happened while I was in the time machine. Stuff happened. I got extremely busy with work, starting in February or so. I was on the road more than usual this year. We decided that after nearly fifteen years in the same house, it was time to move. Hundreds of hours have been poured into this unexpected project. And now here we are, with another PBWQ standing before me. Staring at me. Taunting me. And the thing is, I haven't really gotten past all those blockers I just listed. The Move Project will continue to dominate my so-called free time for the next half year. But . . . but . . . but it's that time again. That time. I don't what it is when October hits, but I just feel the need to get back to writing. It calls to me as strongly as those seventeen Double Stuf Golden Oreos in the other room do. So what do I do about it? Well, here's the other thing. I do something about it. And by "something" I mean just that: the opposite of nothing. Last year I spent October prepping for November. I cranked out fifty thousand words in the first ten days of NaNoWriMo. I kept that momentum going, at least through January of this year. I cannot do that this year. I just don't have the time. But I can't say I don't have any time. There's no reason I can't squeeze in fifteen minutes a day. It's not much, but at the end of a quarter, that's still over twenty hours of work. Sure, I can't write a book in twenty hours. But I definitely won't write a book in zero hours. Between the two, I choose twenty hours. Keep checking up on me. I'll let you know how it's going. Wait a second. What do you mean by "PBWQ 2015"? You just finished the 2014 stretch, and as three people in the world know, PBWQ doesn't start until October of each year. Well, that was the old PBWQ: the Personal Book Writing Quarter. No, that concept has been retired. In its place we have the all-new PBWQ: the Perpetual Book Writing Quarter. That's right. It never stops. Very fitting for the Boy Who Cried Book. And as long as we're on the topic of perpetual book-writing, the current manuscript is temporarily on hold while I work on another facet of my creative endeavors: music. The benefit of this is twofold: 1) I'm back to working on something else that's very important to me, and 2) my brain needs this break. It's important to step back, let things rest, and then return to them fresh. Once upon a time there was a boy who wanted to write a book. Unfortunately, there were a few obstacles in his way. First of all, he had a mortgage, and that meant confronting the baddest antagonist of all: the dreaded Day Job. Secondly, he had lots of other interests besides writing books, and those things always cut into precious writing time. Thirdly (and most importantly) he didn't know how to write a book. But like any good hero, he let none of these obstructions stop him. In fact, not only was he bound and determined to write a compelling work of fiction, he even decided to tell the townspeople about it. "Townspeople!" he posted on his blog one day. "I shall write a book!" "Hooray!" cried the townspeople. "We shall read it!" "Awesome," the boy replied. "You will like this book. It will be about a hero and his or her adventures." "When will it be ready?" the townspeople asked. Years passed and eventually the townspeople gave up waiting for the boy's book. The boy decided he needed some inspiration. "I know!" the boy thought to himself. "If I tell people I'm writing a book, then I'll have to write one!" "Townspeople!" he posted on his blog that very night. "I shall write a book!" "Hooray!" cried the townspeople. "We enjoy reading books. And when yours is finished we shall add it to our reading lists!" "Awesome," the boy replied. "You will like this book. In it the hero faces a great hindrance and the forces of evil are after him or her. He or she will be hard-pressed to succeed!" Years passed and once again, the townspeople gave up waiting for the boy's book. The boy wondered if anyone noticed. "Probably not. I must make another announcement." "Townspeople!" he posted on his blog the next day. "I shall write a book!" At this point the boy expected to hear a chorus of people shout, "Hooray!" Instead he heard a chorus of crickets rub their legs together. "But the book will be good! In it the hero foils the bad guy's plot! Good triumphs over evil. And everyone (who has a talent for it) lives happily ever after." Years passed. And still today the boy keeps trying to write that book. Because that's what this particular boy does. Although there's still officially more than a week left of this year's effort, I'm planning on spending that week eating and sleeping. So I might as well wrap things up now before I slip into a Chex Mix coma. The R&D period in October went very well. I officially brought two of my works-in-progress into the same universe. The book has a good beginning, middle, and end. My 50,000 word synopsis is complete. And editing, though going very slowly, is progressing. My main fear now is just completely getting out of the groove. But, then again, sometimes you just have to get out of the groove for a while. It can make for a much better groove next time. So, bye for now. See you in 2015. Or as I like to call it, "The Year I Really, Truly, Actually, Finally Write a Complete and Finished Draft of a Book." Hey, the 23rd try's a charm, right? I'm still struggling with that Level of Detail problem. In that I'm "finalizing" too much on this second pass and not doing what I'm supposed to be doing. Draft Zero: As an author, tell yourself the story. First Draft: Fix the story. Second Draft: Fix the language. Final Draft: Paint the trim. But I'm kind of doing all three bullet points on what's supposed to just be me fixing the story right now. Because Draft Zero, while a complete story, was in heavy need of some work. And trying to fix too much at once is definitely slowing me down. And if you thought that was the worst of it, think again. Writing in First Person is proving to be far more of a challenge than I thought. But that's the topic of another post. The way I like to write (and the way I believe books should be written, in spite of the fact that I'm no authority on this whatsoever) is to build the book up in layers with increasing levels of detail. The concept of "level of detail" (or LOD for short) comes from the computer graphics industry. In the words of the great and wise philosopher Wick E. Pedia, it "involves decreasing the complexity of a 3D object representation as it moves away from the viewer or according to other metrics such as object importance, viewpoint-relative speed or position." In short: if you can't appreciate the detail, don't waste time and resources creating the detail. Same thing with a story. Start with a synopsis or an outline. Don't start with a finished manuscript. If you begin with a short version of your complete story then you can see if it's going to be worth spending any more time on. In a thousand words or so, can you see your beginning, middle, and the all-important end? Are your protagonist's motivations clear and believable? Is your antagonist the perfect foil? Do you have conflict? A good climax, twist or reveal to reward your faithful readers for their time invested? If you don't have all that in the synopsis, it's very unlikely your completed manuscript will magically have them. So that's what I attempted to do this time. Except instead of writing a one-thousand word synopsis, I wrote a fifty-thousand word synopsis. But it only took ten days, and in truth, the one-thousand word version would have taken about the same amount of time. 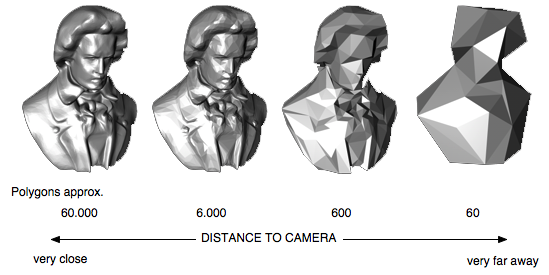 But when I started on that second LOD pass, I jumped right to the 60,000 polygon version of Beethoven. I lied to myself saying, "No, this is important. I just have to nail this first chapter in full detail, to properly set the manuscript in motion." And in hindsight, I was both right and wrong. I'm happy I did that, but no, it wasn't necessary. That being said, I was able to nail down one very, very important decision: the point of view. I began writing the story in third-person limited point of view. However, I finished the last 16,000 words or so in first person. This was a NaNo-related device to help me zoom to the end of the story more quickly. I called it "campfire mode", in that the protagonist, now hypothetically old and sitting around a campfire, recounts her story to a gathering. Then I realized: I like that. So I experimented by writing two versions of the opening chapter, one in first person, the other in third. At first, first person view slightly edged out third person. But then something struck me I didn't see coming: a prologue. It sat outside the story, in the form of a letter written by the protagonist in her later years, but then it hit me: this was the perfect "cover letter" accompanying a memoir. That sealed the deal: first person it was.